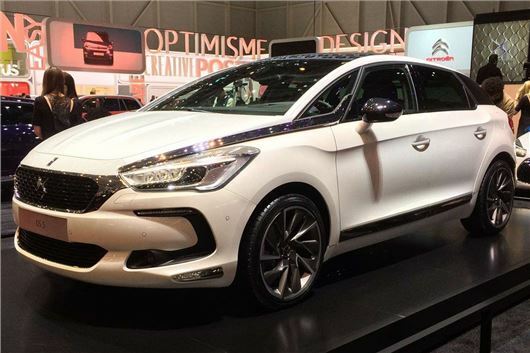 Citroen has launched its revised DS5 at the Geneva Motor Show. The updated version is due in the UK in July 2015, with prices starting at around £22,500 – though Citroen’s not confirmed that yet. Most of the changes for this mid-life revision are visual, in keeping with the DS5’s rebellious aesthetic emphasis, so the car gets a new front end including re-shaped headlamps incorporating ‘scrolling indicators’. And in a move designed to further distinguish DS as a brand in its own right, the Citroen badges have been dropped from the DS5 altogether. Chrome flashes run down either side of the bonnet and up into the A-pillars, while the cabin has been overhauled for a less button-heavy and therefore cleaner look. Intriguing interior technology includes an infotainment system that mirrors a user’s phone screen, and there’s now a smartphone app that allows owners to play with the features of their car while they’re not in it. In response to criticism of the DS5’s less than luxurious ride quality, the company has fettled the suspension, including new dampers, and from launch there’s a range of four engines – including a diesel Hybrid version with four-wheel drive, which at under 100g/km CO2 is one of the cleanest executive cars around. A 165PS THP turbo petrol engine starts the range off, returning 47.9mpg combined and 135g/km. The rest are diesel, all BlueHDI units with 120PS, 150PS or 180PS. The first of those registers 74.2mpg and 100g/km, the second 64.2mpg and 103g/km and the 180PS unit 65.7mpg and 110g/km equipped with a six-speed automatic gearbox.